There are some poeple who choose not to use the stock messaging app and that’s just fine. Maybe you like more custom smileys and features which the stock app can’t provide. For all those things, most people use Handcent SMS. 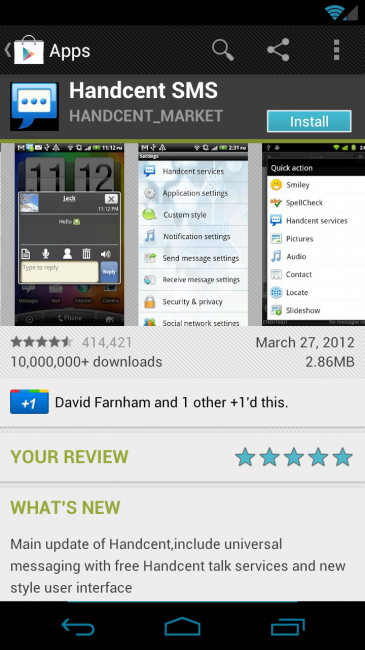 It’s been available for Android since the beginning and it has just recently received a big bump to version 4.0. The newest version has excellent support for Ice Cream Sandwich devices and even has a brand new interface to give it a clean new look. You can even create a group MMS with your friends that own iPhones. Fun, right? If you’ve been a fan of Handcent, then go check it out.